Did you know A&E currently had any scripted shows on the air? I didn’t, and as a result this show flew completely under my radar for its first season. Thanks to this new DVD box set, I’m finally on board. Turns out it’s a bit of a gem buried in their reality-heavy roster, and definitely worth seeking out for any fans of crime procedurals. The show focuses on a laid-back but extremely effective homicide detective blandly named Jim Longworth (Matt Passmore) as he uses his considerable charm and skill to solve the murder of the week. He’s a transplant from Chicago to Palm Glade, Florida, relocated due to a rumored dalliance with the wife of his ex-captain that ended up with him getting shot by the jealous husband. Once in Florida, he befriends a cute local nurse who happens to be married to an incarcerated criminal, leading to some minor romantic tension as they fight their mutual attraction. That’s the entire setup of the series, with no other ongoing central plot, making it easy for new viewers to hop on at any point. Longworth is an unconventional cop, consistently refusing to follow protocol but also contributing a high case closure rate that guarantees his continued employment. He’s something like if Han Solo was a homicide detective, a lovable rogue who marches to the beat of his own drum but always delivers exceptional results. That may be a bit thin of a concept to hang an entire series on, but the weekly cases are written well enough that it’s usually fairly difficult to guess the killer before Longworth solves the case. He doesn’t have any remarkable skills other than an uncanny sense of connecting the dots others miss, and he’s also so relaxed that he never seems to be working or even all that engaged in catching the bad guys, making his eventual success each week all the more rewarding. Passmore completely carries the series, with only minor assists from love interest Callie Cargill (Kiele Sanchez) and his co-workers Carlos Sanchez (Carlos Gomez) and nerdy genius Daniel Green (Jordan Wall). Cargill’s son and Passmore’s boss pop in from time to time as well, but for the vast majority of each episode Detective Longworth is left to his own devices as he interviews witnesses, examines evidence, and eventually catches the killers. Passmore is fantastic in his role, bringing a breezy nonchalance and wry humor to the character that is instantly appealing and worth revisiting each week. The Season One box set includes all 13 episodes along with bonus features including deleted scenes, a gag reel, behind the scenes featurettes, and director and cast commentaries. The bonuses aren’t especially enlightening, but do offer a bit more fun and background for viewers looking to expand their experience. 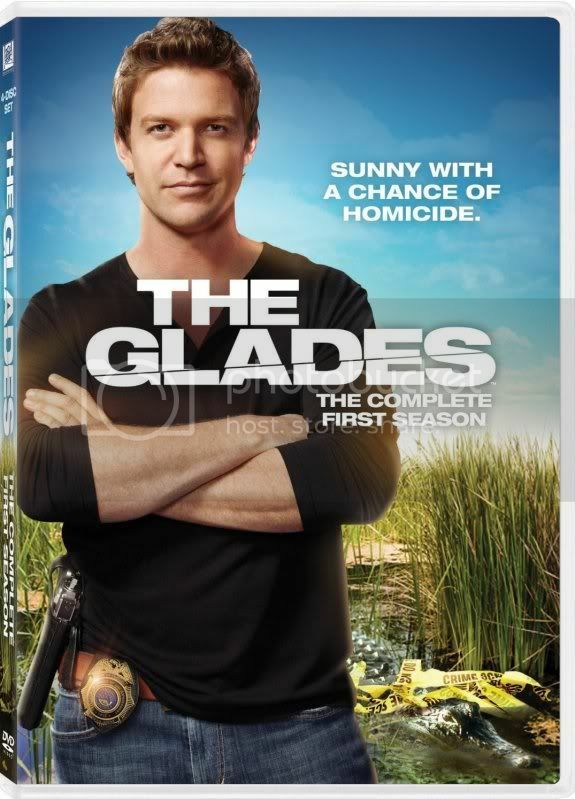 The Glades: The Complete First Season arrives on DVD tomorrow, while Season Two is just getting under way on A&E. I didn't realize that The Glades is on A&E either, Steve! I usually think of reality shows more along the lines of "family jewels," etc. Isn't The Glades scheduled to come back this month or so for Season Two ?